Progressives are saying this is a moment of transformational politics. Is the party leadership listening? Yesterday, last night and this morning it was all about Hillary, and she didn’t let her supporters or her party down. 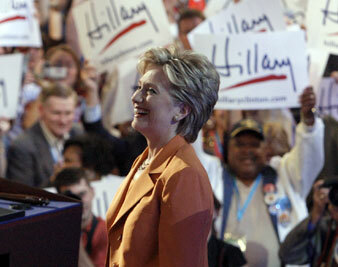 Go (or, depending on where you stand, Welcome Back) Hillary! But while all eyes are on the podium, the election and the direction (of the country) may be determined by events and ideas under consideration outside the formal arena. At the notorious 1968 Democratic Convention in Chicago, I remember sitting in the office of Larry O’Brien, who by that time, was running the Hubert Humphrey campaign. He had three television sets, tuned to the three big TV networks. On two of them, cops were beating up and otherwise abusing demonstrators in the streets, and on the third set, a political insider, Richard Goodwin (who had moved, after Robert Kennedy’s assassination, to the McCarthy camp), was giving his analysis of the delegates. O’Brien turned off the sound on the two street-violence pictures, and turned up the sound on the Goodwin interview. It all seemed to me emblematic of the way in which the party establishment missed the historical moment, the real story of what was happening at their own convention. The point here is not whether one agrees with David Sirota that “The progressive wing of the Democratic Party has finally defeated the corporate wing of the Democratic Party” but that the conversations outside the arena should remind those inside that the debates between Clinton, Obama, Edwards et al. in the primaries were in large part over who was more antiwar, who was greener, who cared more about labor. They assumed, in other words, that the old Democratic Leadership Council’s push towards so-called moderation was yesterday’s news. There is much talk here about this being an “historic convention.” And of course what most people are referring to is the first nomination by a major party of a black candidate for President. But the talk in the penumbra of the Pepsi Center embodies the content of what could really make the aftermath of these proceedings historic, i.e., what Borosage and others have called “a transformational moment.” Let’s hope that the new leadership has not turned the sound off.